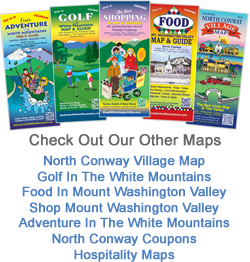 Being a small publisher of tourist maps and guides I am asked weekly by travelers from all over the world for information about New Hampshire’s White Mountains, Mt. Washington Valley, North Conway, or New Hampshire in general. “Where should a family of 12 stay for Christmas?” What’s a great family restaurant near where we are staying?” Do you know of any coupons for Ziplining, horseback riding, sleigh rides?” How far is the “Old Man” from the Kanc?” (Kancamagus Highway). What’s the closest golf course to where we are staying?” Where are the Outlets located?” I love what I do so I am usually thrilled to hear people’s plans for traveling to the areas and regions I promote. In the past year, I have spoken with people from Japan, China, Russia, The Netherlands, Newfoundland, Great Britain, Ireland, South Africa, New Zealand and hundreds from Canada. All want a locals’ perspective and really want to hear my opinion. I am careful to not steer anyone to any particular place unless they know exactly what they are looking for as did the 12 people coming up for Christmas Eve. That was easy as there were only a few places open to accommodate them for Christmas eve and day dinner. Let me start with suggestions for your first day or two in the White Mountains. If you are staying in the North Conway area, a morning walk around the North Conway Village is a must. Some of the stores open at 9am. (Zebs General Store) #LargestCandyCounter #AllNewEnglandMade. There are some great family restaurants that welcome kids and serve awesome breakfast. (Peaches). If you come in a little later and just want a cool vibe coffee shop with local art displayed inside, The Met is where it’s at and serving breakfast, salads, and sandwiches into the night. The lil’ neighborhood village library is always a fun stop if you need free Wifi or want to relax with a good book. And their architecture is as iconic as the Conway Scenic Railroad in the center of the village by Schouler Park. For more on reading and relaxation, White Birch Book Store is by far my most favorite bookstore anywhere and for many reasons…..the staff knows what they are talking about and they have the largest selection of cards of any store I have been in. (Yes, people still send cards). Headlines probably has the most eclectic selection of gifts in the Valley. The Shops of the Eastern Slope Inn is a grouping of tenant shops located in ESI related properties throughout the Village. After an authentic, old school, train ride up to Bartlett and back, check out the unique shops of the Village. April Cornell, Beggars Pouch, the League of NH Craftsman and Assets Jean Co. are all high end but have affordable quality products, some made right here in the Valley. If you’ve worked up an appetite for lunch, there are so many unique places to go, from the best burgers at McGrath’s Tavern, or the best Pizza at Elvio’s Pizzeria, to organic and all natural at the Local Grocer cafe, deli and bakery. Be Well Studios is also known for their awesome Yoga classes #Yoga #Organic. There are also lunches available at The Met, Peaches and at Chef’s Bistro, too. Chef’s Bistro is located in the center of the Village and has the best seats in the Valley to watch what’s happening on Main Street. It’s also a romantic place for an uptown urban feel. For more lodging choices there’s the Eastern Slope Inn in North Conway Village, The Colonial Motel on the southern end of Main Street and the Eastern Inns on the northern end of Main Street. For a B&B experience, I’d suggest the Red Elephant Inn, Cranmore Inn, or the Stonehurst Manor. For the animal lover or pet owner, Karla’s Pet Rendezvous has daycare/playcare daily for your pet or you can bring them up to stay for your entire time you are staying in Mt. Washington Valley. For vacation rentals as in renting an entire home or condo, FourSeasonsLodge.Com as well as AttitashRealty.Com, BadgerRealty.Com and PinkhamRealEstate.Com all have a wide range of options. Now for the really important info…..spas and chocolate! There is a spa services banner at NorthConwayVillage.Net. Click on that for spa services info and for the best chocolate and cupcakes in the world, stop by the Bavarian Chocolate Haus, or Cupcake Winners White Mountain Cupcakery both on Main Street. SOOOOooooo Good! 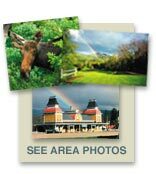 If you want to know more about local brewed beers, go to AleTrail.net – For the best local art in notecards, limited edition and open edition prints, paintings, and photographs go to WhiteMountainArt.Net. Or by appointment at 603-387-0886.The HandCrafters Barn also carries this artwork.